Buying real estate in a foreign country might seem a little intimidating – everything is new and different! But that’s why it’s so important to have a local real estate agent helping you through the process. In every real estate transaction around the world, it helps to know the ins-and-outs of the local system. As a Honduran who spent much of my life in the U.S., I love being able to share my local insights in a way that expats understand. It makes for an easier transition for you as you search for and buy your Roatan real estate. 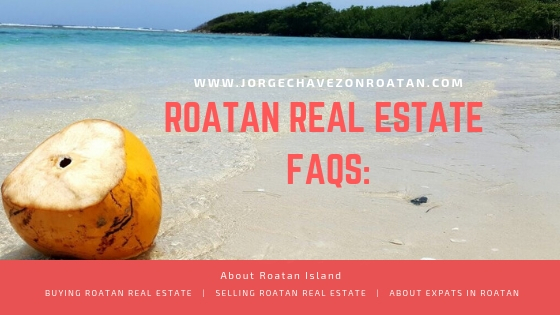 To help familiarize you with Roatan real estate transactions, I’ve compiled a list of FAQs related to real estate on the island. As always, feel free to reach out anytime with specific questions you may have. Does Roatan use a Multiple Listing Service (MLS)? Yes, the Roatan MLS is an incredibly helpful tool for all potential buyers. Through our coordinated real estate system, you can search for your ideal property all in one location. Roatan’s use of an MLS is unique in the region, but we all know we work better together to help you find your dream home. Can a foreigner purchase property in Roatan? Yes, foreigners can purchase up to 3,000 square meters, or nearly 0.75 acres, in a single purchase. There are many foreign land- and home-owners here in Roatan. What if I want to buy a larger plot? You can absolutely purchase a larger plot by creating a Honduran corporation and completing the purchase via that entity. I can recommend a reputable local Honduran attorney for this process, so don’t worry about the details. It’s a pretty straightforward process and is common amongst foreigners looking for larger homes or multiple investments. What is the financing situation in Roatan? Generally speaking, Roatan banks don’t usually make loans to non-residents, and North American banks don’t usually make loans on foreign properties. Many buyers take a second mortgage back home or buy a property in full in Roatan after the sale of property back home. What is the cost of construction in Roatan? Right now the average cost per square foot in Roatan is between $75 and $110. That price differs based on wood versus concrete. Where you build your home might determine the materials that you should use, but more often, it’s simply a personal choice. Traditional island homes are built of wood. They rest on stilts and then sometimes a second home will be built below, on the ground floor. More recently, construction has begun to vary widely as people from all around the world come to live in Roatan. What are the popular building styles and designs in Roatan? Roatan enjoys a wide variety of real estate options. Always keep in mind that if you’re building your dream home, you absolutely should work with a local architect. As a tropical island in a foreign country, you want to make sure you adhere to all regulations while also working with the natural environment. Should I look at houses or condos in Roatan? Both! It entirely depends on your preferences for lifestyle and location, but we have both options in abundance in Roatan. From gated communities with tons of amenities to rural homes that are water access-only, you can choose your own adventure here! How does estate planning work in Roatan? Keep in mind that you may be living in a different country from your relatives and heirs, so a clear understanding of next steps is incredibly important. You should work closely with your attorney to ensure everything is handled correctly. What are the costs associated with selling Roatan real estate? Real Estate commission: The standard commission amongst all Roatan real estate companies in the Roatan Realtors Association is 10%. Capital Gains Taxes: If your property has proven any gain, taxes are set at 4%. Survey: A survey of your property will usually cost between $250 and $300. Catastral: Catastral is the deeded value according to the municipal government. You will pay usually between $50 and $80. National Taxes: The Honduran National Government Tax Agency (CPAT) levies taxes related to the sale of real estate property up to 15%. The total taxable amount can vary based on the real estate company or agent you work with, so it’s best to clarify these exact costs up front. Feel free to contact me directly if you want further clarification on this point. RTN (Registro Tributario Nacional): Your RTN is your personal tax ID number in Honduras. If a new RTN card is needed, that price is between $100 and $200 to obtain it. Attorney Fees: The attorney who calculates the capital gains will charge between $200 and $250. Wire Fees: Outgoing wire fees are usually $45 per transfer. POA (Power of Attorney): If you cannot attend your closing and instead use your Power of Attorney to process all closing documents, this usually costs $250. HOA (Home Owners Association): All current year fees must be accounted for, with costs prorated between the buyer and seller. These will obviously vary based on your home location and annual fees. Do I need Honduran residency to own real estate in Roatan? In terms of residency, Canadians and Americans are allowed to visit Honduras on a tourist visa for up to 90 days at a time. Generally speaking, if you’re investing in a vacation property or in a snowbird home, you won’t require Honduran residency. If you’re moving to Roatan permanently, I recommend you apply for residency. Can a foreigner run a business in Roatan? If you want to operate a business in Roatan, purchasing an already-operating business will allow you to continue operations while processing your final paperwork. Opening a new business requires a longer wait time, which could still be beneficial as you set up and prepare to open your doors to the public. Where do expats live in Roatan? The most popular residential areas for expats moving to Roatan are West Bay, West End, and Sandy Bay in the western side of the island. Centrally located Pristine Bay is Roatan’s only golf community and is incredibly desirable. On the East End, there are many neighborhoods becoming popular with expats, especially Politilly Bight, First and Second Bights, Port Royal, and Calabash Bight. French Harbour and Coxen Hole are the primary commercial areas of the island. In both, you’ll find banks, shopping, grocery stores, municipal offices, hospitals, gas stations, and more amenities. Do I need a car if I live in Roatan? If you move to Roatan permanently, you will likely want to purchase a vehicle. Some residents will also buy a scooter for short trips, especially those living in West End and its surrounding neighborhoods. How do I get to Roatan island? The primary transportation hub for Roatan is Coxen Hole, the capital. The international airport is just outside the main town and the first cruise ship port is also located downtown. A bus terminal is also downtown – but our buses are actually just large vans. You’ll find the ferry dock and second cruise ship port (Mahogany Bay) closer to French Harbour. What is public transportation like in Roatan? Taxis and buses are readily available throughout the western side of the island. Bus routes run between West End and Coxen Hole, between Coxen Hole and Flowers Bay, and between Coxen Hole and French Harbour. Taxis are run on a colectivo system, meaning you will pick up and drop off other passengers along the same route. If you prefer a private taxi, you must request it as privado. Past French Harbour to the east, public transport is less common, so you will need your own vehicle. How big is the island of Roatan? The island of Roatan is the largest of the Bay Islands of Honduras, located about 40 miles from the northern shore of Honduras. It’s about 35 miles long and only stretches up to 5 miles wide at its widest point. A central hilly ridge runs the length of the island, dropping down to the shore on both sides. What is the weather like in Roatan? Roatan enjoys a lovely tropical climate year-round, which includes rainy seasons. The main rainy season lasts between October and March, but it’s not at all like monsoon season. You’ll have plenty of bright sunny days during that time, which is also the high tourist season. The summer sees typical tropical rainstorms intermittently, but we are very lucky to be outside the hurricane belt. What is the topography of Roatan? The incredible benefit of our tropical weather is our lush, verdant jungle. Roatan isn’t an arid, flat Caribbean island. We have gorgeous green hills rolling the length of our island, with palm trees, fruit trees, and vibrant tropical flowering trees everywhere you turn. There’s nothing better than picking fresh mangoes for breakfast off the tree outside your bedroom window! What languages are spoken in Roatan? The main language spoken in Roatan is English. However, if you speak Spanish, it will certainly help! The national language of Honduras is Spanish, so legal documents will always be completed in Spanish. Public schools are also taught in Spanish, so keep that in mind if you’re moving here with children. Most private schools offer a bilingual education. What are the grocery stores like in Roatan? Grocery stores in Roatan are filled with many products you’ll recognize from home. With such an international population and so many tourists visiting our island, you’ll find lots of imported goods alongside local staples. If you move here permanently, you’ll easily find local products you’ll love, which can replace the more expensive imported brands. There are large grocery stores in Coxen Hole and in French Harbour, plus many mini-marts all around the island for your basic needs. What is the medical care like in Roatan? There are multiple medical centers in Roatan that can cater to your needs. In Coxen Hole, you’ll find the public hospital and the private Woods Clinic. There is a new hospital in French Harbour that was completed in 2016 in cooperation with Hospital Cemesa, a very popular medical center on the mainland. You’ll also find several medical clinics around the island. In Sandy Bay, you’ll find the AKR clinic (aka Cornerstone at Anthony’s Key Resort), which also houses the island’s hyperbaric chamber. Clinica Esperanza (aka Nurse Peggy’s Clinic) is also located in Sandy Bay. At Parrot Tree Plantation east of French Harbour, you’ll find the GARM (Global Alliance for Regenerative Medicine) Clinic. There are also several pharmacies around Roatan, primarily in West End, Coxen Hole, and French Harbour. You can purchase many medications over the counter here in Roatan. You’ll find brand names will likely differ, but if you know the main ingredients you require, you can find similar medications here. What are the schools like? Can my kids attend public or private school? There are multiple private schools in Roatan offering a bilingual education. Sandy Bay, Coxen Hole, and French Harbour are the main areas with schools at the moment. With a constantly changing island population, new schools tend to pop up and old schools sometimes merge or evolve based on population needs. Some schools and some expat families choose to integrate home schooling with private schooling, so there are many options to choose from for your child’s education. What can I expect for utilities in Roatan? Electricity costs in Roatan might be your highest expense at around $0.40/kW. Solar panels are an option for your home, although of course the initial cost of installing them must be taken into consideration. Most kitchens in Roatan will have gas ovens, so you’ll replace your propane tank as needed for around $20. Homes might have a private water supply or be on public water, so those costs can vary but typically run around $25/month. TV/internet packages can be purchased for typically much cheaper than in the U.S. – including quality Wi-Fi. Expect to pay around $75/month for packages including movie channels like HBO. Do you have more questions about real estate in Roatan, moving to Roatan, or expats in Roatan? I linked to several of my blogs here, but have a look at the rest of my blog for more insights into life on the island. You can also reach out to me anytime to ask your specific questions – I’m always happy to help! Looking for an investment opportunity? This oceanfront home in the Caribbean for sale might just be your perfect answer. Located in quiet, tranquil Jonesville, on Roatan’s East End, this 6-bedroom, ..